A city with historic origins made history again when the first new federal interstate in almost 30 years opened in town. 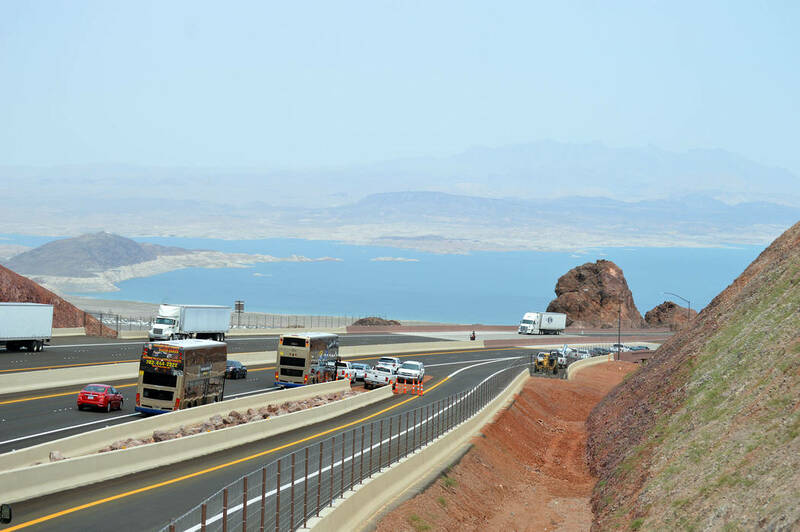 Celia Shortt Goodyear/Boulder City Review Interstate 11 in Boulder City features a scenic overlook that provides a bird's-eye view of Lake Mead. Celia Shortt Goodyear/Boulder City Review Local, state and federal officials, from left, Clark County Commissioner Jim Gibson, U.S. Rep. Ruben Kihuen, U.S. Sen. Dean Heller, Clark County Commissioner and Regional Transportation Commission of Southern Nevada Chairman Larry Brown, U.S. Sen. Catherine Cortez Masto, Federal Highway Administration Director of Field Services Peter Osborne and state Sen. Joe Hardy, christen the new Interstate 11 on Aug. 9. 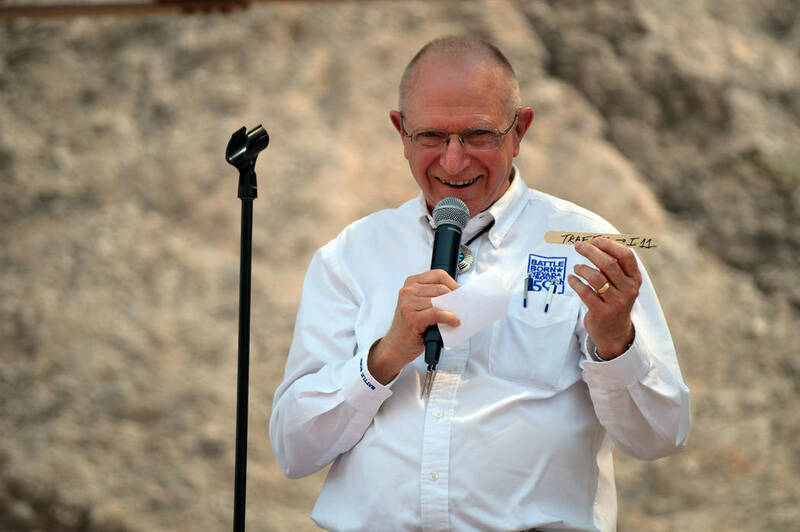 Celia Shortt Goodyear/Boulder City Review Nevada Sen. Joe Hardy Jr. holds up the "ahh stick" he made when he was on Boulder City Council and concerned about the traffic in the community. Hali Bernstein Saylor/Boulder City Review Interstate 11 opened to traffic Aug. 9. 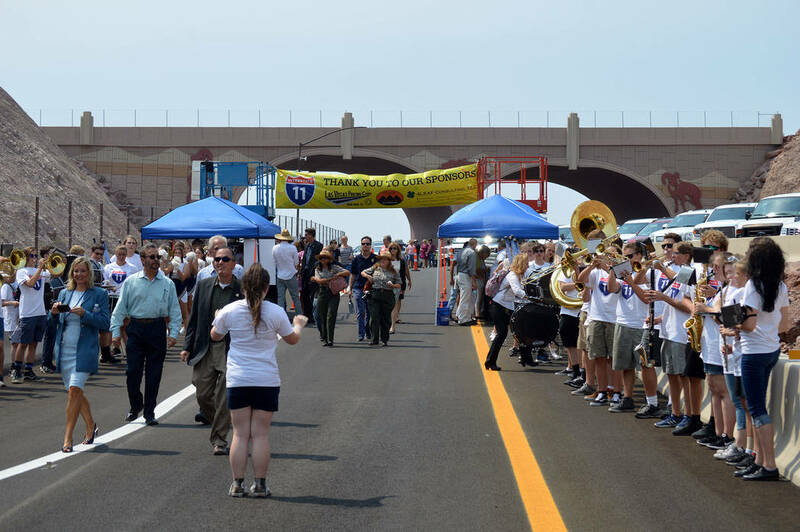 Celia Shortt Goodyear/Boulder City Review Hundreds people attended the grand opening ceremony for Interstate 11 on Aug. 9. It took place at a scenic overlook on the highway. 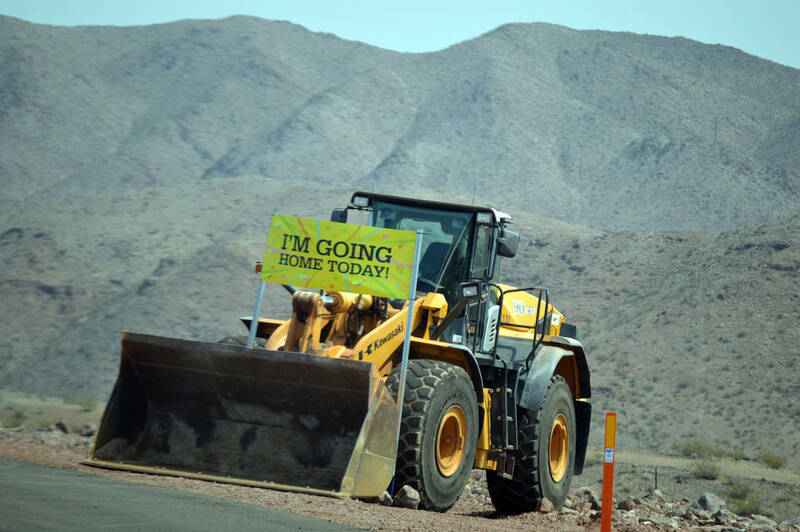 Celia Shortt Goodyear/Boulder City Review Las Vegas Paving Co.'s equipment was able to go home and leave Interstate 11 on Aug. 9 when the highway officially opened. K.M. 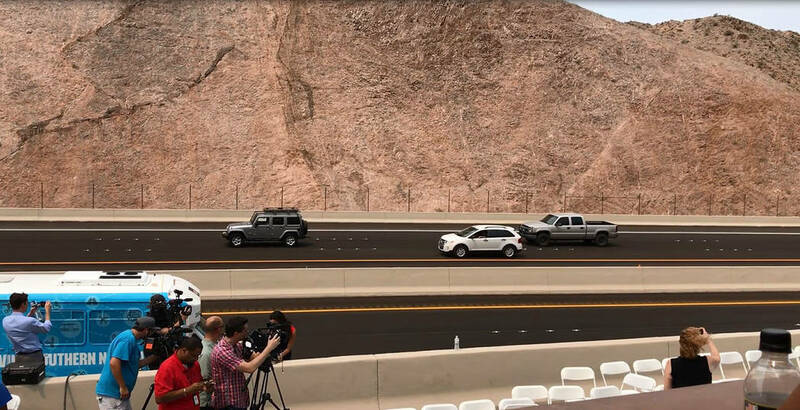 Cannon/Las Vegas Review-Journal A bighorn sheep watches during a ceremony at the Interstate 11 overlook marking the opening of a 12.5-mile section of the freeway, also known as the Boulder City Bypass on Aug. 9. Motorists can now drive 15 miles of I-11, which is expected reduce travel time to Arizona by up to 30 minutes. 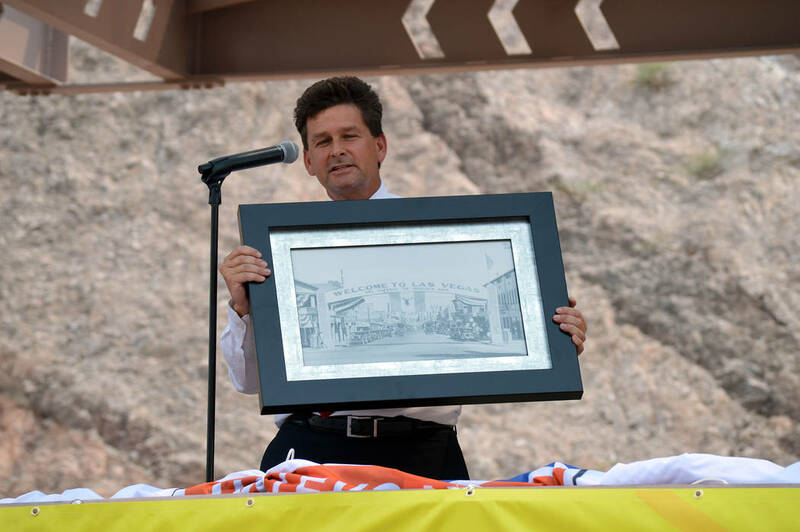 Celia Shortt Goodyear/Boulder City Review Boulder City Mayor Rod Woodbury highlights the history of the town and the Hoover Dam during Interstate 11's grand opening ceremony Aug. 9. 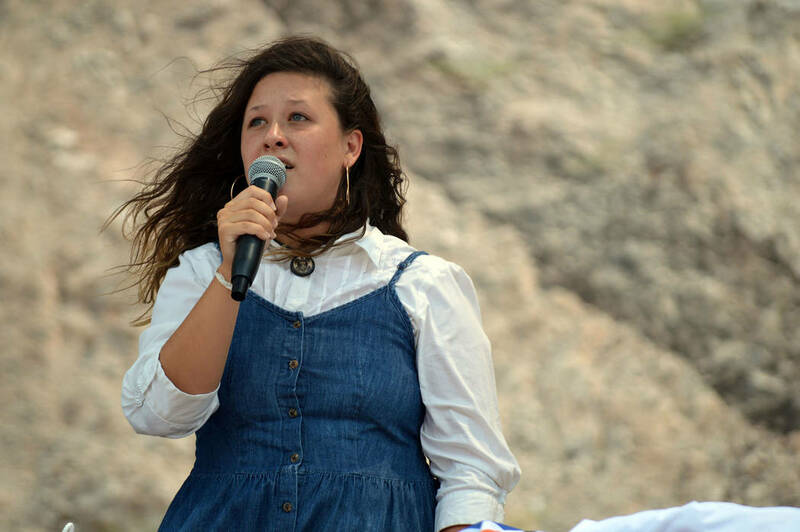 Celia Shortt Goodyear/Boulder City Review Rory Leavitt sings "Home Means Nevada" at the grand opening ceremony Aug. 9 for Interstate 11 in Boulder City. 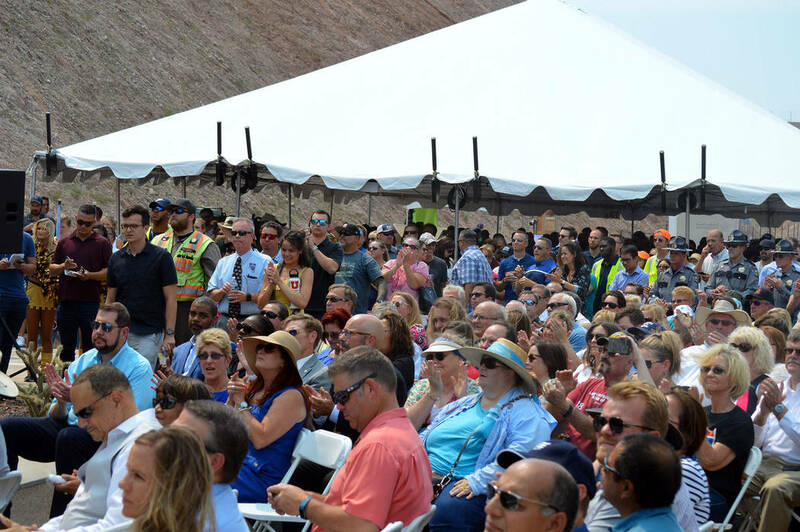 Celia Shortt Goodyear/Boulder City Review Five hundred people attended Interstate 11's grand opening ceremony Aug. 9. 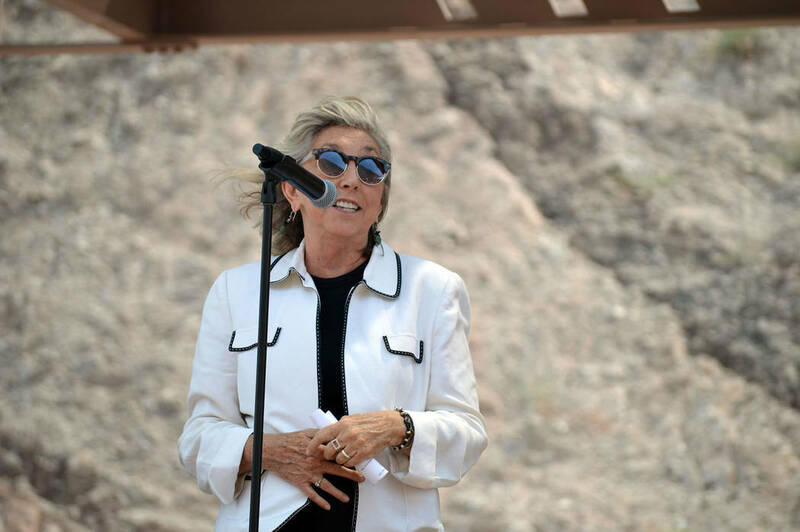 Celia Shortt Goodyear/Boulder City Review U.S. Rep. Dina Titus thanks everyone who helped create the new Interstate 11 on Aug. 9 during a grand opening ceremony. Celia Shortt Goodyear/Boulder City Review The Boulder City High School marching band serenades attendees at Interstate 11 grand opening Aug. 9. Hali Bernstein Saylor/Boulder City Review Local government officials came out to celebrate the opening of Interstate 11 on Aug. 9 including, from left, Boulder City Council members Kiernan McManus, Warren Harhay, Peggy Leavitt, Henderson City Councilwoman Gerri Schroder and Boulder City Manager Al Noyola. 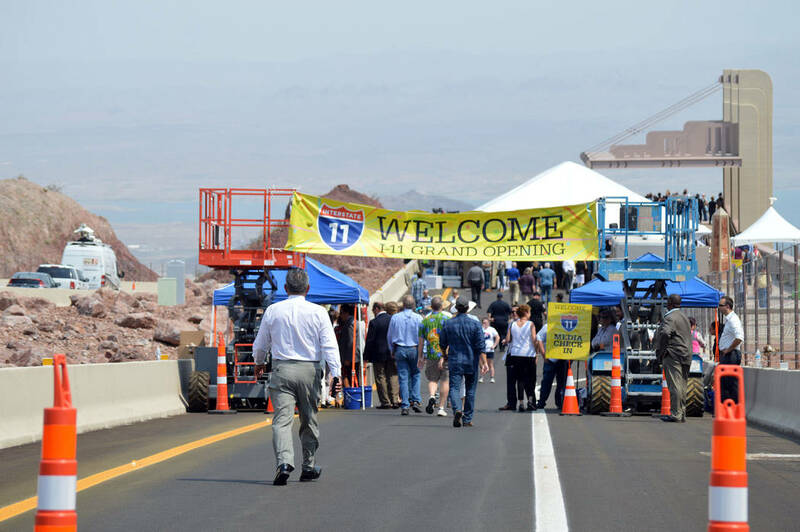 On Aug. 9, federal, state and local officials gathered at a scenic overlook on Interstate 11 in Boulder City to officially open the highway. “When we work (and) collaborate together, we reach great heights, like today,” said Mayor Rod Woodbury. The 15-mile stretch of I-11 runs from Henderson to the Hoover Dam and goes around Boulder City. It is expected to reduce travel times between those areas by as much as 30 minutes, according to the Nevada Department of Transportation. NDOT and the Regional Transportation Commission of Southern Nevada worked jointly on the road, which cost $318 million. It was paid for through federal and state funds with Clark County’s fuel revenue indexing tax. Boulder City resident and state Sen. Joe Hardy Jr. reminisced about his time on the Boulder City Council, when he realized something needed to be done to make travel faster and traffic safer. “This could not have happened without Republicans and Democrats not only reaching across the aisle but cooperating across the aisle,” he said. He also said that rather than being known as the Boulder City Bypass, I-11 should be known as Boulder City’s Gateway to Nevada. 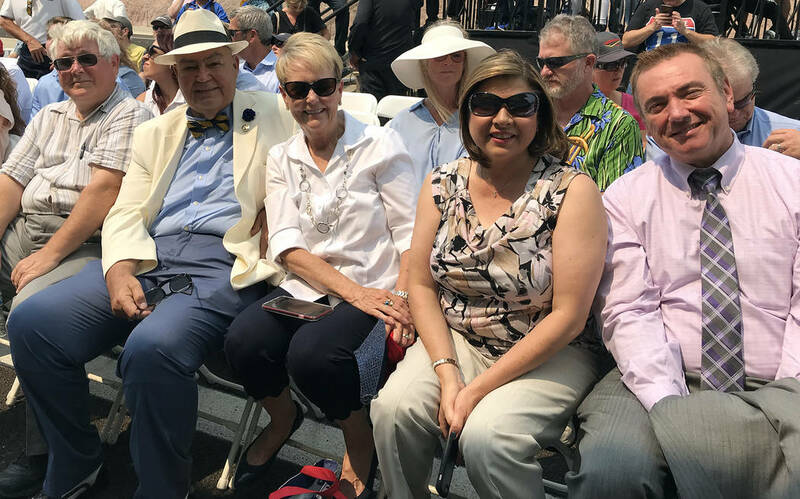 City Manager Al Noyola called the opening monumental and an important step in transforming the city to meet the changes coming in the 21st century. 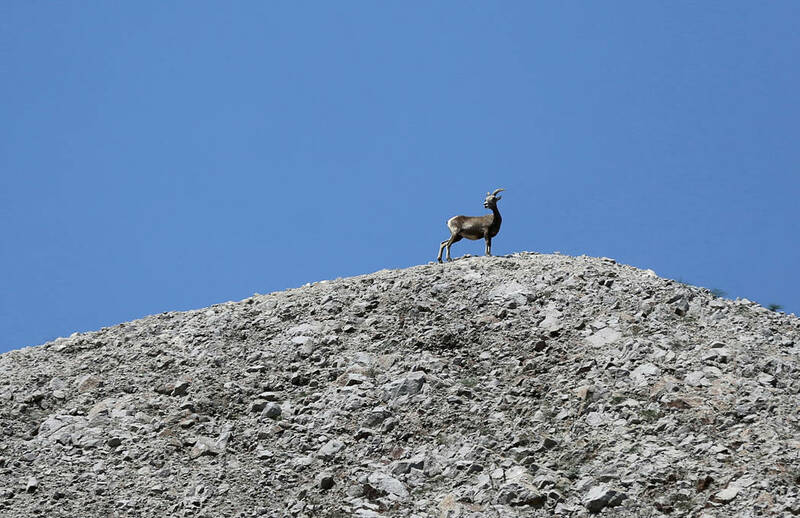 The celebration, witnessed by a small herd of bighorn sheep overlooking the interstate, featured performances by Boulder City High School’s marching band and cheerleaders, along with the Vegas Golden Knights’ Drumbots and cheerleaders. Numerous elected officials, including Sens. 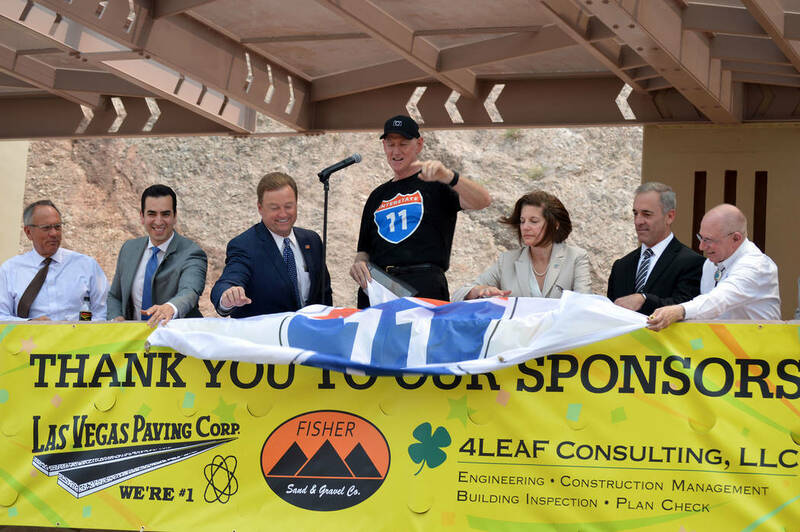 Catherine Cortez Masto and Dean Heller, Reps. Dina Titus and Ruben Kihuen and county Commissioners Larry Brown and Jim Gibson, thanked those who worked on the interstate and noted the collaborative spirit that enabled its construction. As the interstate takes traffic around town, there have been some concerns about how that will hurt local businesses. Instead of hurting businesses, he thinks it could help them. “I think they’ll find more people will visit because of less traffic,” he said. “This will be good for the city, especially with all the traffic crippling it right now,” said former Mayor Roger Tobler, who was instrumental in getting the project started. Tobler said he worked with all the businesses along Boulder City Parkway, and the vast majority of them want the bypass. Though in the short term there will have to be some adjustments to people’s habits of patronizing businesses along the stretch west of Buchanan Boulevard, Tobler said, the mid-term and long-term prospects for success look good. Boulder City Chamber of Commerce CEO Jill Rowland-Lagan said she also thinks there will be more local opportunities with I-11 open as people will see how easy it is to get to town. “It’s a great place to go, and they can get there quick,” she said. The interstate is the first step in linking Las Vegas to Phoenix, and it’s set to eventually stretch from Mexico to Canada. About 500 people attended the grand opening.